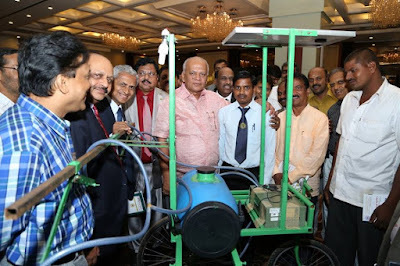 Sangappa Sankanagoud, who has completed his BTech in Agricultural Engineering from the college recently, put considerable efforts into creating the innovative solar sprayer device. Apart from the frame resting on three wheels, the machine includes a solar panel, a battery, motor pump, tank, spray boom, handle, hose pipes, nozzles and lights. Being on earth, he has carried his dreams to where ‘sky is the limit’. At the age of 8, when other kids used to play, Sangappa was helping his farmer father on the field to feed his family. No matter what problems came his way, the young boy sacrificed sleep on hundreds of nights and challenged all the troubles. 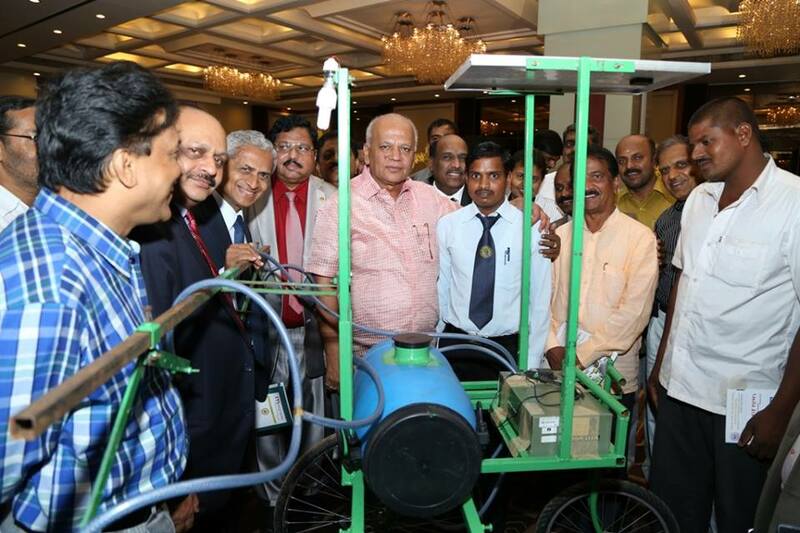 With 3,600 farmers showing an interest in buying his solar sprayer, today he has become one of the best young agricultural scientists and innovators in India. “High clearance solar sprayer machine is used to spread the pesticide on crops. Other sprayers are present in the market but their efficiency is very low. Usually, machines available in the market are short in height, harming the crop, but my machine can be adjusted up to two feet which will not damage the crop. I like making agricultural machines that aid in the cultivation of crops, so I am interested in innovation as well as in cultivation” said by Sangappa. The sprayer is easy to use and light weight; all its parts can be dismantled and easily transported. The wheels have long life tubeless tyres which protect them from puncture. A solar panel, DC battery, DC motor and frames are some of its other features. One person can easily operate the machine and also dismantle it. The solar sprayer can be continuously used for seven hours if fully charged. It can be used during the day even if the solar panel is not charged. As an extra feature, a mobile phone charging point has been provided to keep a cell phone. The total height of the machine is 10 feet, which can be adjusted by up to 5 feet. The weight of the machine is 30 kgs, it increases to 55 kgs when loaded with water. In the coming future, I am also planning to reduce the weight by 10 kgs. His ambition is to start an industry so that he can make different types of machines and provide them to the farmers as soon as possible. Initially, his plan is to invest Rs. 10 lakhs to Rs. 15 lakhs for a small industry where other types of useful machines will be manufactured. He has also invented another machine, which can directly convert the dry agricultural products to powdered form. Red chilies can be converted to chili powder. The cost of this machine is Rs. 15,000; it can give 16 kg of flour per day (2kg per hour). The young innovator has been facilitated by the Federation of Karnataka Chamber of Commerce and Industry (FKCCI) in the event Manthan at Bangalore. Sangappa won the first prize of Rs 1.5 Lakh. In Green summit 2014, an awards function was organised to recognize the Indian leaders in Renewable Energy sector and acknowledge their contributions that take the industry towards a new and innovative path. Here, Sangappa won the first prize for his High Clearance Solar Sprayer. The young innovator happily says that, "Indian farmers are poor so I want to invent light and inexpensive machines so that it will be effective and easy to use. Winning first prize at the FKCCI event was one of the most precious moments and the happiest days of my life.” Sangappa Sankanagouda belongs to Chikumbi village in Bhagalkot district of Karnataka.